Congratulations to all the amazing teams that made this season's ELMC unique experience and to the 12 (!) Judges of the Court of Justice of the European Union that spent their day with our students. The European Final of the European Law Moot Court was held at the Court of Justice of the European Union, in Luxembourg on Friday, April 17th 2015. Best Written Pleading: Leiden U.
Finalist CR: Paris II U.
Semi-Finalist Teams: Liege U. 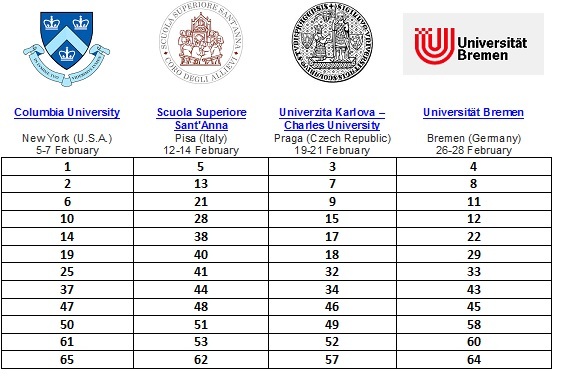 & Leiden U.
Congratulations to the qualified teams and to all the students that managed to submit written pleadings. A huge thanks to the 40 ELMC Judges that proceeded to the Double, and some times Triple (! ), Blind Grading. Please, send the registration form to your Master of the Moot (MoM) before Friday 16th January by email. NY qualified teams should send this document as soon as possible starting now. Download registration form. The payment of the fees will be done in cash once you arrive to the RF University, except different agreement with the RF MAster of the Moot. If you have any problem, please contact with your MoM. Please feel confidence to contact with your MoM in reference to all organization questions concerning to the RF. If you have any general doubt about the competition, you can contact directly with us in the previous email.